Years of travel brought researchers to New Zealand where they discovered an outstanding natural substance. Liver oil purified from unpolluted, deep water sharks contains squalene and alkylglycerols (AKGs), recognized for their benefits to the human body. The use of squalene as a dietary supplement and topical oil treating minor skin irritations and dry skin dates back for centuries in Asia. AKGs offer nutritional support to the immune system. Vitasalus™ (formerly Equinox Products) offer the only commercial oil with a natural abundance of these potent ingredients. There is absolutely no other shark liver oil product on the market that matches the ultra purity and potency of this unique and freshly produced New Zealand product -- the one-and-only Vitasalus (formerly Equinox Products) Ultramarine™ Shark Liver Oil. This superior, all-natural, whole shark liver oil is minimally processed to ensure that all of its natural trace elements are maintained. Harsh processing and heat are avoided which would strip the shark liver oil of many of its valuable natural constituents. It is 100% pure, with no artificial coloring, additives or preservatives. This shark liver oil is also environmentally sound as only sharks that are caught as a by-product of deep-sea fishing are used, making a valuable remedy from a natural resource that would have otherwise gone to waste. This fresh, ultra pure and potent shark liver oil has tremendously benefited countless individuals from around the world. Available in two easy forms: easy-to-swallow gelcaps and skin topical application. There is absolutely no other shark liver oil product on the market that matches the ultra purity and potency of this unique and freshly produced New Zealand product -- the one-and-only Vitasalus (formerly Equinox Products) Ultramarine™ Shark Liver Oil. This product is often referred to as sea gold or oceangold because it originates from God's amazing medicinal treasure chest, the deep sea. Ultramarine Shark Liver Oil is naturally rich in alkylglycerols (or alkoxyglycerols, AKGs, glycerol ether lipids) and squalene, and is extracted from the liver of deep-water Etmopterus sharks, which inhabit the cold, non-polluted waters of New Zealand at depths of 3,000 to 5,000 feet. This superior, all-natural, whole shark liver oil is minimally processed to ensure that the alkylglycerol (or Alkoxyglycerol, AKG, glycerol ether lipid) and Squalene components and all of its natural trace elements are maintained. Harsh processing and heat are avoided which would strip the shark liver oil of many of its valuable natural constituents. It is 100% pure, with no artificial coloring, additives or preservatives. This shark liver oil is also environmentally sound as only sharks that are caught as a by-product of deep-sea fishing are used, making a valuable remedy from a natural resource that would have otherwise gone to waste. Ultramarine Shark Liver Oil is an amazing supplement containing alkylglycerols (AKGs) - renowned for offering nutritional support to the body's natural defense system and the primary active component in shark liver oil. AKGs occur naturally in small amounts in human breast milk, bone marrow, the liver, and the spleen, all of which are involved in the production of white blood cells. Also formulated with squalene, recognized for its rejuvenating skin care properties. 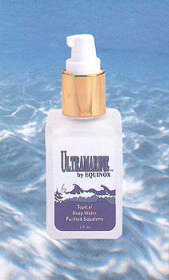 Ultramarine Shark Liver Oil, extremely rich in squalene and alkylglycerols, is truly nature’s amazing healer. This minimally processed deep-sea shark liver oil, derived from deep-water Etmopterus sharks inhabiting non-polluted waters of New Zealand, also contains natural trace elements, enzymes and anti-oxidants that enhance its effectiveness. 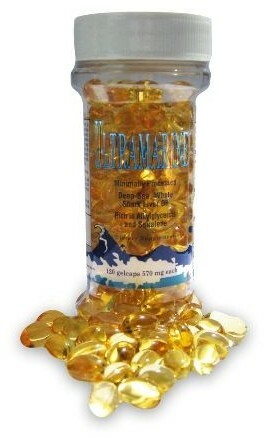 Ultramarine Shark Liver Oil is known to help strengthen and regenerate the immune system while benefiting many other functions and organs of the body. For adults and children. One adult serving provides 360 mg of Diacylglycerol Ethers (D.A.G.E.) yielding a pure and potent 140 mg of Alkylglycerols with 450 mg of Squalene. Each bottle contains 120 gelcaps (570 mg capsules). There is absolutely no other natural squalene oil product on the market that matches the ultra purity and potency of this unique New Zealand product -- the one-and-only Vitasalus™ (formerly Equinox Products) Ultramarine™ Squalene Topical Oil. Made from 99.5% Natural Squalene (not hydrogen modified such as squalane), touted for rejuvenating and moisturizing properties. Skin feels smooth, not greasy. Excellent for use on minor cuts, dry skin, skin irritations, and sunburn. Or as a soothing aftershave. Squalene, first isolated in 1916 by a Japanese chemist, has been used in Asia for years as a health food and as a topical oil for relief of skin conditions from shaving roughness, minor wounds, frostbite, and dry, chapped skin. Light marine fragrance. For adults and children.